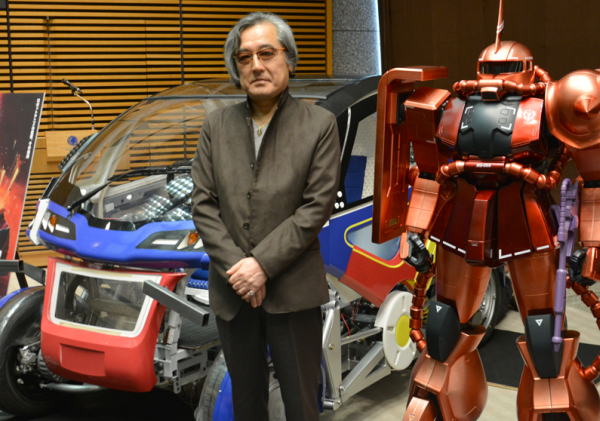 Kunio Okawara, 67 year old mechanical designer in the Japanese anime industry is well-known for his designed mecha robots over the years for science fiction media franchise Gundam. Well, after four long decades of illustrious career, the mechanical designer has turned his attention to something else. Okawara has teamed up with EX Machina Corporation to develop a two-seat electric concept car. Christened Ex Machina, the electric car was shown at Ueno Royal Museum which is holding a retrospective of Kunio Okawara’s 40 year career from August 8 to September 27, 2015. According to AmiAmi, the concept car can transform its shape and should be able to do what a full-sized automobile can’t. The vehicle is being called as a drivable smartphone or portable information terminal. 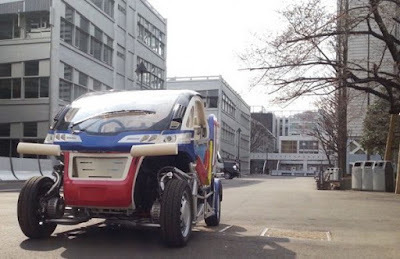 The ultra-compact mobility car is being developed by Tokyo’s Four Link Systems and will come with a mounted camera for panoramic view and internet connection. The artist said that when the transformer car will hit the market, he’d like to add the Federation or Zeon logo. The company hopes that Ex Machina will soon receive governmental approval and be available for sale in the next two years.